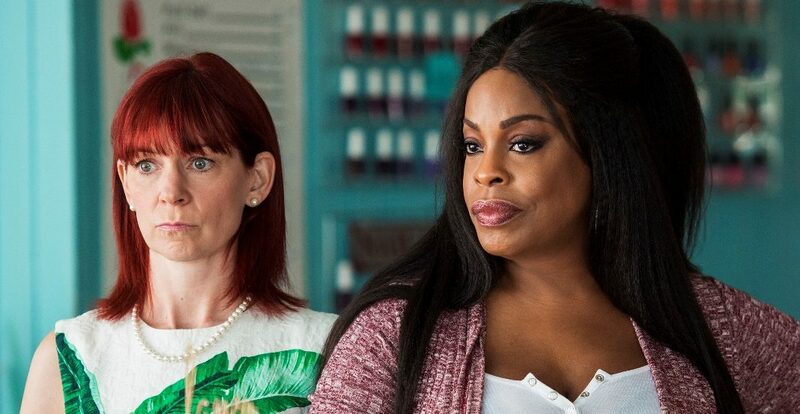 Claws TV Review - TNT Weaves Decent Drama Into Unwatchables - Are You Screening? TNT is taking a gamble with Claws, a series that revolves around the staff of a nail salon and they’re underworld connections, and it stems from the curious clash of demographics and the fact that it seems to try to alienate everyone. The show centers on Desna (Niecy Nash), who owns a nail salon in South Florida. She has a crew of faithful employees, including Polly (Carrie Preston), who has just returned from the sort of vacation that requires she now wear an ankle bracelet, and Quiet Ann (Judy Reyes), who is basically the bouncer. Unfortunately, Desna is desperate to move up in the world, and has her sights set on a more upscale salon. That’s unfortunate because, in order to make her dreams happen, she’s connected herself to Roller (Jack Kesy), who is running part of his Uncle’s, Uncle Daddy (Dean Norris), illegal drug trade. In a scenario that doesn’t actually make any sense, Desna takes the cash that a strip mall Doctor is bringing in by doling out prescriptions to anyone who comes through the door. We enter the show as the deal is supposed to be up because Desna agreed to a one-year contract… or something, but when she tries to cash out, she discovers that criminals aren’t generally interested in giving out money in order to lose their money streams. The show progresses as a kind of whirlwind of distractions and catastrophes, and there’s just no telling how Desna can possibly come out the other side. The pilot is, at least in some sense, perhaps the best version of establishing unbelievable complexities in recent years. When Desna isn’t dealing with her unsure connection to psychopath Uncle Daddy, she has members of her staff stabbing her in the back, a crew of Russians apparently taking a lot of interest in her movements, and (apparently) a nail salon company uncomfortable with her effort at purchasing a franchise. The show’s difficulty lies in its apparent attempt to meld audiences in a way that, while certainly unique and creative, isn’t necessarily a good bet. Desna eventually manages a fair amount of depth, as does some of the rest of the cast, but the show is generally about people that lovers of dramatic development and black comedy don’t want to watch. There’s a reason that no one has come up with a scripted version of Teen Mom. Actually, there are thousands of reasons, but the main one is that to approach such people through a lens that, for lack of a better word, validates them, is to have gone a little goofy somewhere. Claws is the show that’s gone that goofy. It’s a show about people who have nothing, except a $15,000 purse and, to a lesser extent, the psychology behind believing that means they’re “winning.” That’s an idea that only works as a farce, and I have to admit that Claws actually works fairly well, but you’re hard-pressed to sit through an evening with these people if you get farce, and if you’re actually a fan of the Kardashians (or whatever the hell), I don’t know what you get out of layered drama and self-mocking characters. There are moments in the show that are potentially rather hilarious, and there’s something about following Desna as she more or less wanders a while in Job’s shoes, but getting the most out of such elements requires settling in with these characters. That’s a lot to ask of anyone. Worse, everyone involved is a lot better than this show, and that frequently stands out in a way that is distracting. Carrie Preston is one of the best, and most underappreciated actresses working today, and it is occasionally difficult to watch her play through the goofiness. Still, even when you’re rolling your eyes at the overelaborate mustache twirling of Uncle Daddy, among other things, the show may manage to ingratiate itself to you just by virtue of trying like hell. If you can suffer through it, and make your peace with the general idea, it’s a pretty good ride.